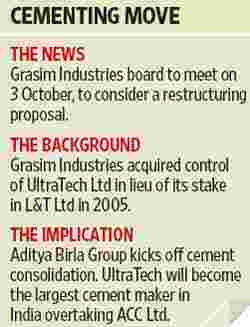 Mumbai: The Aditya Birla Group is restructuring flagship Grasim Industries Ltd by spinning off its cement operations and then merging this with its subsidiary UltraTech Cement Ltd.
Grasim’s board is meeting on 3 October to discuss a proposal to spin off the cement division into a separate company, said a senior Grasim executive who did not want to be identified because he is not authorized to speak to the media. This spun off entity would be merged with UltraTech, but that process could take some time, this person added. An Aditya Birla Group executive familiar with the restructuring said this had always been the plan when the group acquired UltraTech from engineering firm Larsen and Toubro Ltd in 2004. This person, too, did not want to be identified. Grasim has informed the stock exchanges about the meeting on 3 October and said that this will be to consider “a proposal for the restructuring of the business". An Aditya Birla Goup spokeswoman declined to comment for this story, saying, “We will not comment on market speculation." The market, however, seems to have got a whiff of Grasim’s plan. Shares of UltraTech have risen 14.41% in three trading days to Rs848.90 each, while those of Grasim have gained 9.71% to Rs2,700.80 each. On Thursday alone, UltraTech’s shares gained 6.37%. The move will also create a new flagship for the group. When the merger is complete, the cement company will boast revenue of around Rs11,767 crore. The cement business, which contributes 69% to Grasim’s revenues, reported a net profit of Rs1,647.96 crore on revenue of Rs6,371.66 crore in 2008-09. Grasim ended 2008-09 with Rs18,474 crore in revenue and Rs2,615.21 crore in net profit. It ended the first quarter of 2009-10 with Rs5,080 crore in revenue and Rs1,270.18 crore in net profit. The challenge for cement companies is to minimize the cost of serving the customer rather than the cost of production, said Kaustav Mukherjee, vice-president and partner of global consulting firm AT Kearney on 12 August while commenting on Dalmia Cement (Bharat) Ltd’s expansion plans. According to his firm’s estimates, India’s cement production will expand to 550 mt by 2020 and its annual per capita use of cement will rise to 350kg from 150kg. The merger would involve a huge payout by the group as stamp duty, a charge paid to the government over the transaction, said a former managing director of a multinational company. This person, who did not want to be identified, said that it would also take time for Grasim’s limestone mining licences to be transferred to UltraTech. The Aditya Birla Group had undertaken similar restructuring exercises before to focus on its core strengths and new businesses. In 2005, the $29.2 billion by revenue conglomerate created Aditya Birla Nuvo Ltd to incubate its new business initiatives such as telecom, garments, insurance and other financial services. The restructuring saw Indo Gulf Fertilisers Ltd, Birla Global Finance Co. Ltd and Indian Rayon Ltd coming together under Aditya Birla Nuvo (earlier Indian Rayon and Industries Ltd). Last year, Grasim sold its sponge iron business to Welspun for around Rs1,000 crore. Grasim, a viscose maker, is nearing the end of its capital expenditure cycle and would start generating free cash flows and turn net cash, wrote Jinesh K. Gandhi, an analyst at Motilal Oswal Securities Ltd, a Mumbai-based stock broker. The company is financially well placed to fund its growth plans and drive consolidation in the industry, Gandhi wrote in his report dated 3 August. The merger of Grasim’s cement business with UltraTech has been on the cards for some time. The two merged their marketing teams two years ago. Many cement makers see scale as a significant competitive advantage. Puneet Dalmia, managing director of Dalmia Cement (Bharat), said the Indian cement industry will be controlled by 8-10 players by 2020. Two players will control 100 mt each of cement capacity and others will own capacities between 25 mt and 50 mt each, Dalmia told Mint in August. His company wants to raise its capacity to 35 mt by 2020, from 13.5 mt.